WillingToBeLucky.net: RUN to see 'Vanya and Sonia and Masha and Spike' on Broadway!!! RUN to see 'Vanya and Sonia and Masha and Spike' on Broadway!!! 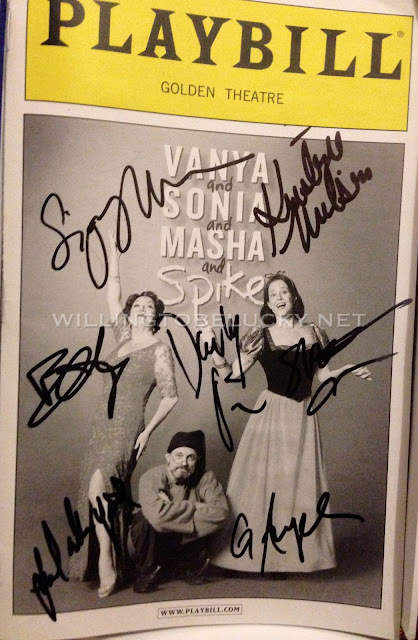 When I heard that there would be a Broadway transfer of the Lincoln Center production of Christopher Durang's 'Vanya and Sonia and Masha and Spike', I rejoiced because I had missed its off-Broadway run! I had only heard fantastic things and was saddened I had been unable to catch it! The show stars Sigourney Weaver, David Hyde Pierce, Kristine Nielsen, Billy Magnussen, Shalita Grant and Genevieve Angelson. Three siblings, Sonia (Nielsen), Vanya (Pierce) and Masha (Weaver) reunite at the home in which they grew up and where Sonia and Vanya currently reside. The incredibly dramatic and self involved Masha is the well known actor in the family, rarely coming to visit because of her busy schedule. This time she returns with a companion, the young Spike (Magnussen), also an actor. Ms. Grant plays the eccentric housekeeper who has visions of the future and shares them with the unbelieving family. Along the way, they are joined by the neighbour's niece, Nina (Angelson), a lovely girl whom Spike has taken a liking to, much to the chagrin of Masha. Hilarity ensues over the course of this two act play. The family, Spike and Nina all attending a costume party in some of the best costumes that lead to wonderful impersonations and physical comedy that had me laughing, loudly! The show is intelligent and full of wit, including its fair share of Chekov humour. I especially loved David Hyde Pierce's execution of Vanya's passionate rant about how the world has change, and not for the better. Overall, a fun, laugh-inducing, heartfelt show filled with brilliant performances by the entire cast. I cannot wait to see this show again and again...and again! DO NOT miss this fantastic piece of theatre! 'Vanya and Sonia and Masha and Spike' is at the John Golden Theatre. It runs until June 30th.